Armadillos are amazing animals, although you may wish they were a tad less amazing when it comes to their digging abilities. 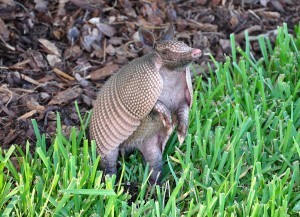 If you have an armadillo hanging out in your yard, you may be only noticing the less helpful aspects of their presence. But these nocturnal omnivores do some good stuff too – like scarfing up gobs of worms, grubs, and insects and aerating your soil, which will help your plants grow better. It’s also true, though, that in the process of digging, they may accidentally damage or uproot plants. Their digging in your lawn is aimed at finding worms and grubs to eat. They may also chow down on berries if you have them. When attempting to keep armadillos out of a yard, you must take into account their exceptionally long and sturdy claws and their imposing ability to dig. Afflicted with poor eyesight, armadillos rely on their keen sense of smell to find food. If you’re wondering why armadillos chose your yard, merely asking that question means you’re already on the right track. Why? Because if you only get rid of the armadillo you have and don’t change things up a bit, it won’t be long before another armadillo wanders in and finds your yard a great place to dig in. Things that tend to attract armadillos include brush, tall grasses, and rock piles—all of which harbor insects, of course, and that’s what the armadillos are actually excited about. So, eliminate or reduce these things in your yard and armadillos are more likely to keep on trekking until they find a yard that has them. Owing to the armadillo’s amazingly keen sense of smell, strong-smelling things have great potential to offend an armadillo enough that he might move elsewhere. Things to try are pine needles or pine mulch—which smell great to us, but not to armadillos—and rags soaked in ammonia or vinegar. Another option is urine soaked kitty litter. Place the soaked rags or used kitty litter in the burrow, and spray the ammonia or vinegar around the perimeters of your yard, using a garden hose sprayer. Protect your eyes with goggles and use a mask to minimize inhalation of the fumes. 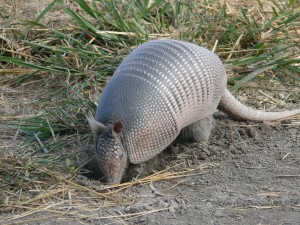 Armadillos have very long, sturdy claws making them a formidable digging machine. While the armadillo is out of the burrow, prevent her from reentering by covering the opening with a section of wire mesh, attached only on one side of the opening. This way she can push her way out if you were wrong in thinking she was out of the burrow, but she cannot get back in. This should never be done when dependent young are likely to be inside the burrow, because they cannot push their way out, and you’ll be condemning them to starvation if their mother cannot get back in. Babies are born in the spring but check with local a local wildlife rehabilitator or your state natural resource agency for more accurate timing for birthing and rearing in your area. 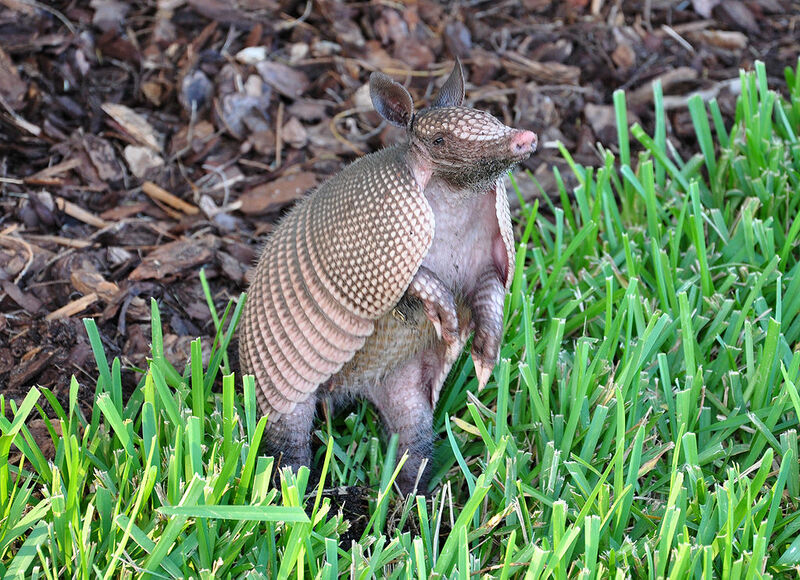 Once you’ve eliminated the things that are attracting armadillos to your yard, if they’re still coming in and digging where you don’t want them it may be necessary to take the next step—permanent exclusion. If you opt for a fence, the bottom edge should be buried at least 12 inches below ground, or they may dig under to get inside. If you are not concerned about them digging in the yard, but do worry about them digging under a walkway or around your foundation, you can skip the fence and just install an L-shaped footer of hardware cloth against the edge of the walkway or foundation. Here, too, bury the bottom edge 12 inches deep to be effective at keeping out armadillos.